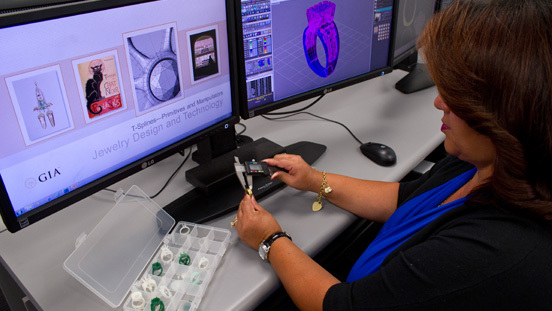 The Jewelry Design & Technology diploma programme covers topics essential to becoming a jewellery designer and CAD (computer-aided design) technician, including designing a piece of jewellery from a concept, creating it in CAD to engineering specifications and understanding the challenges that come with its manufacturing. Here are some of the skills you’ll learn. Learn to operate prototyping equipment. 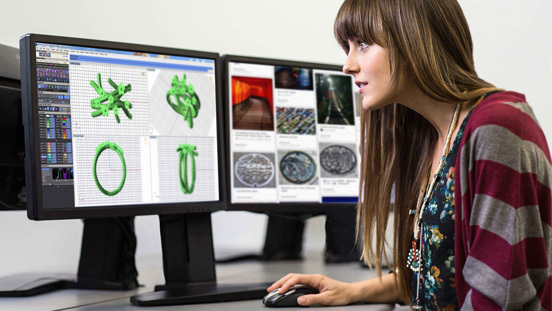 Know what affects CAD designs. Explore theory and techniques to inspire your jewellery designs. 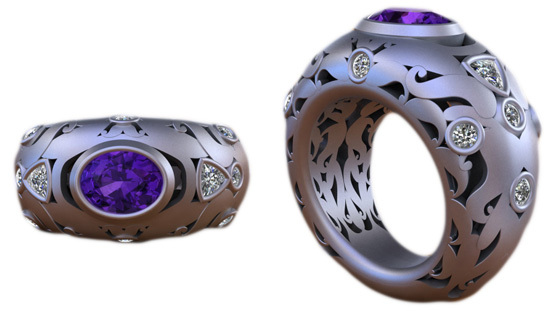 Use ZBrush to create a hand-sculpted look to your jewelry designs. Show off your hard work at a design show at the end of the Jewelry Design & Technology diploma programme. Since friends, family and industry VIPs will be in attendance, be ready to share your creations. 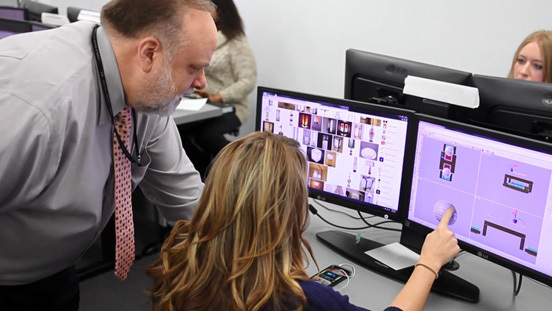 Personal attention from a seasoned instructor, immediate feedback on your work, creating mood boards for inspiration – these are just some aspects of the Jewelry Design & Technology diploma programme. 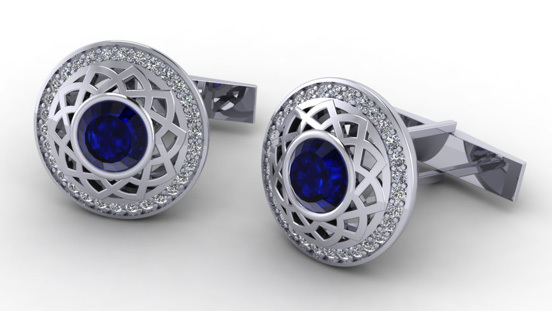 Jewelry Design & Technology diploma alum Nelly Chhor’s clever use of simple geometric patterns made for elegantly complex cufflinks. You’ll be inspired by important periods of jewellery history, and learn how to use these and other motifs as inspiration for your designs. 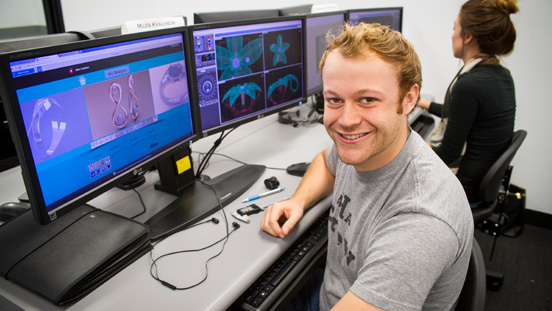 Study with classmates from around the globe who share your passion for design and technology. Watch students study Japan’s Edo period, learn about the beautiful motifs hidden in sword hilts and architecture, and give them a modern spin. By 3D printing your CAD models and comparing the resin prototypes to your CAD (Computer-Aided Design) designs, you’ll learn about scale, proportion, engineering and manufacturability. 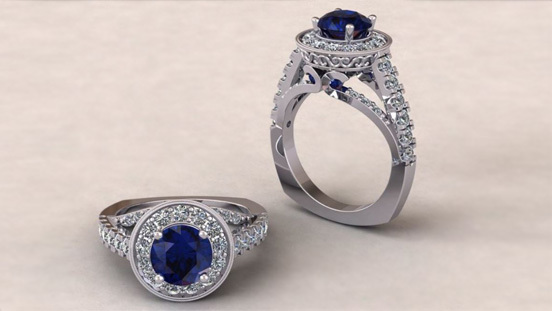 A wonderfully ornate shank is the star in Jewelry Design & Technology alum Tyler Abe’s sapphire engagement ring. Creating such an intricate piece was a highlight of his GIA education. 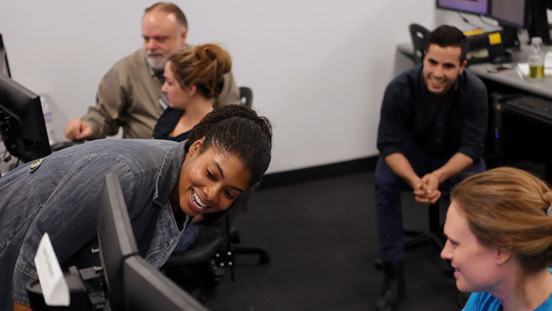 One step closer to success: a student adds to a digital portfolio that will be shared with potential employers and future clients. 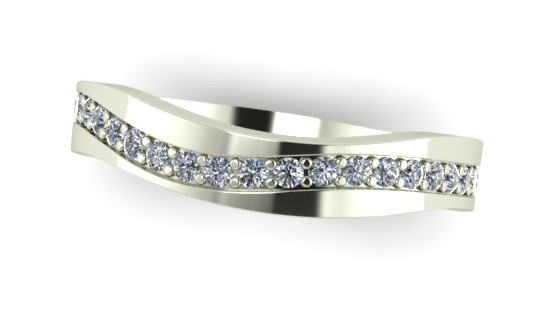 Jewelry Design & Technology programme alum Jessica Meng gave her imagination free rein in this edgy wedding band. Get ready to channel your creativity to make beautiful jewellery. Jewellery Design & Technology alum Tess Lecklitner’s statement ring is a study in contrasts. 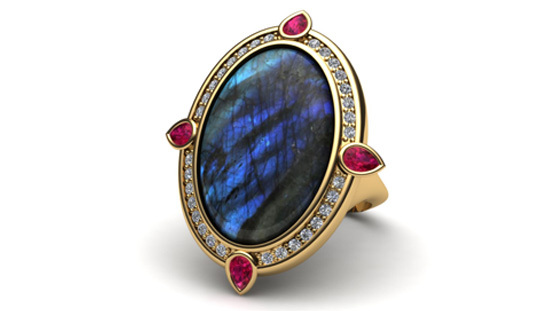 A labradorite is surrounded by diamonds and accented by rubies. Design five rings using tourmaline (real stones provided). That’s the challenge that was given to students. See what happened. Creating designs for your portfolio with a 3D printer is an essential part of the programme – and will prepare you for a changing industry. Learn organic surface modelling software like ZBrush, and you’ll create sculpted pieces – like this one designed by Devon Chalmers, which was inspired by the Art Nouveau era. Ornate. Detailed. Negative Space. Jewellery Design & Technology programme alum Ninad Prasad Sawant made use of these devices in his ring design. What better way to end the Jewellery Design & Technology programme than with a design show? 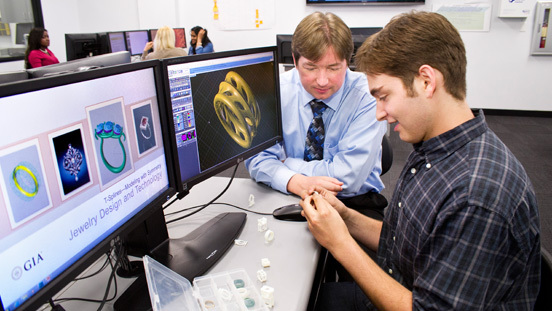 Here a student shows his work to an industry VIP. Available in Carlsbad and New York. Immerse yourself in the world of gems and jewellery and earn your Jewelry Design & Technology diploma by studying at a GIA campus. This transformative programme opens up a world of opportunity.